I have here on my desk a big Ziploc bag stuffed with all kinds of seed packets. Long ago, I wrote "Summer Seeds" on the outside of the clear bag. Many times when I open my storage closet and reach for batteries or nails, the sack falls out, and I am reminded of what I haven't done. Several of the packets are unopened ones that were bought either by my late husband or me. Most, however, are envelopes marked with someone else's handwriting. Several are from a couple, and I am embarrassed that I cannot remember who they are. One says "Linearis - White Zinnias '94. This same couple gave me seeds of orange linearis zinnias, as well as pink asters, small blue asters and a commercial packet marked "Hummingbird Garden." I assume all these other assorted packets - too many to name - are from the same era 21 years ago. One thing they all have in common is that they are seeds for flowers that require sun. In 1994, I hardly had a speck of sun on these four acres. Today, there is one patch up on a slope at the little house that gets the afternoon western sun. I do have my terrace up here, but even parts of it are shaded now by a maple tree. So, what if I had a big, flat open space that got sun all day, what would it look like? First of all, it would not be the Gertrude Jekyll border I wanted in the 1980's. That would have been a clipped hedge with tons of perennials and shrubs that would start with the tallest in back and taper down to the shortest in front. It would have been a long, wide border, and the colors would have ranged from cool to hot along the straight line. Today, I would want a space similar to the one pictured above, where green boxwood hedges have been mixed with plantings of flowers. I might not have rows of a single plant, like the peonies seen here, but I would want a plan where I could keep things tidy. A jumbled border for someone with my chaotic habits just would not work. 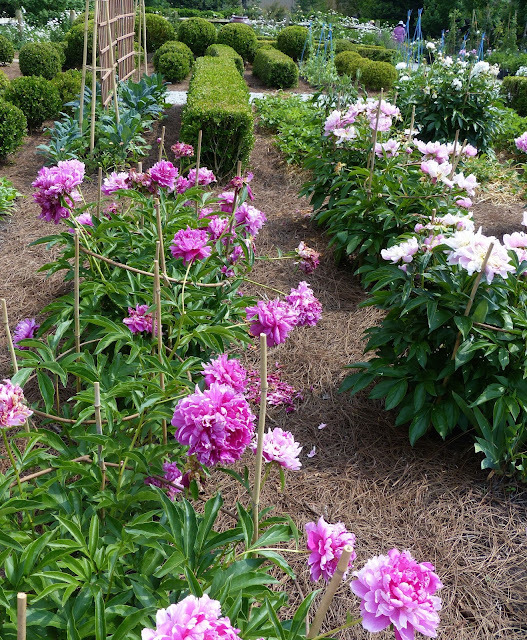 If you went on the Atlanta Botanical Garden's annual Mother's Day tour, you may have visited this garden. It's actually a commercial space where garden designer Alex Smith keeps plants for use in his clients' gardens. I worked there on the Saturday of the tour, and by the time I got to walk around, it was very hot. I realized that I would have to plant shade trees in this imagined garden of mine, but I would have them in a row, sort of like an allee, with benches set along the way. Then, the above gardens would be off to the side. I'd also have paths of tiny gravel (or coarse sand?) that would be easy to walk on. But here I am back to reality. I just walked out of my basement door and came face to face with three does, scrounging for food. They weren't here in 1994 when I accepted those seeds from the couple whom I can't recall. And, this up and down terrain with some very steep banks is not going to flatten out. Plus, even though I've lost trees, many more have grown tall and cast a lot more shade like the maple. The good thing about being a garden lover is that there is always room for dreaming. For 20 years, I have kept stacks and stacks of cut granite rescued from a house that burned next door, with the intention of someday building a small stone cottage. That's where I'll have this fantasy sun garden, where the pink climbing rose I bought three years ago will not languish in shade but will clamber over the door of said cottage. My space won't be as large as Alex's, of course. It will be manageable, and I will go out each morning and cut bouquets to take to an ailing friend or someone who needs cheering up. When I first married, I would take seeds down to my parents' farm and plant them. It was nice - there were no deer there then either. I made sunny borders and had things just for cutting. My mother loved cut flowers, and there was always a bouquet on the kitchen table. She and Daddy had huge vegetable gardens, and Mother would plant flowers for cutting in rows, just like she did the vegetables. I can't help but be curious to know if any of these seeds are still viable. I doubt it, but then there's only one way to find out. I'm too late this year, so I guess one more year won't matter. My parents are gone now, but there is someone who keeps a fenced-in vegetable garden at the farm. I could mark off an experimental plot and see what happens. It won't be the same as having my own sunny garden surrounding my stone cottage. That day will come, I feel sure. Right now, I just need to appreciate the fact that it is always a few degrees cooler here in the shade of large, old trees. There's something to be said for that, too. When the time is right, plant the seeds. You may be amazed at how much actually will grow.